Last weekend after the clothing swap Gary and I attended a cocktail wedding that evening. I had planned on wearing something else. This City Chic dress, that I picked up during their 50% off sale, had just arrived the day before. When I was trying to choose my shoes, though, I spotted these amazing new beauties that I picked up from Originals. I was going to wear them at the Golden Gods but I was not sure how comfy they were going to be for a full evening. To be honest, these were pretty comfy with some built in padding but they did start to cause some blisters at the peep toe area. This almost always happens to me on these kinds of shoes but sometimes a little discomfort for some cute shoes is worth it for me. They are such a statement piece I think I’ll only be pulling them out every now and then. Next time I’ll have some Moleskin padding ready to help with the rub. 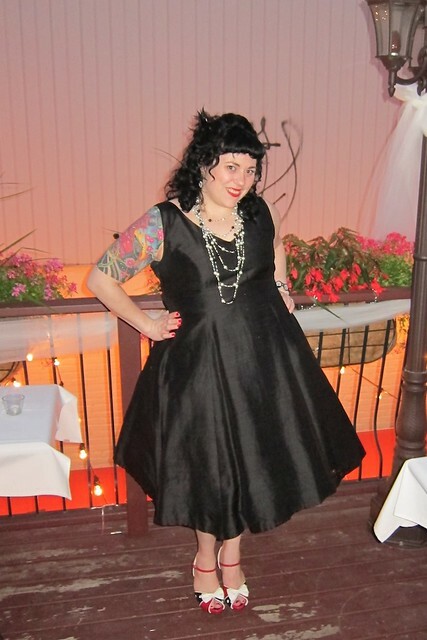 Since the shoes were the focus, I kept everything else simple with my black silk tea length dress that Jane Bon Bon created for me. The last time I wore this dress it was for my mother in law’s birthday party where I paired it with a pearl embellished sweater. 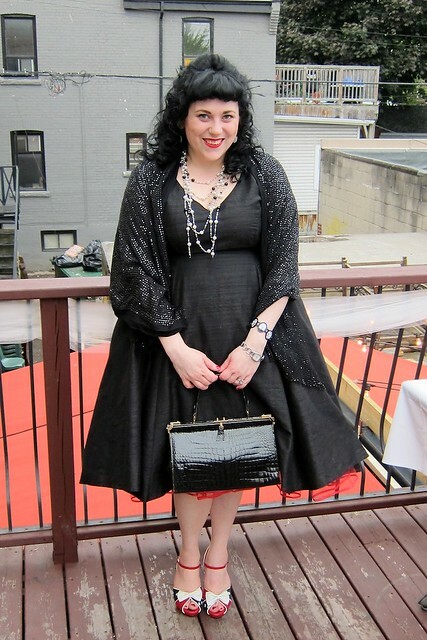 This time I replaced the cardigan with a light sparkly wrap for a bit of shine, reintroduced the pearls with the necklace, added a red tea length crinoline for some volume, polished off a vintage bag, and added a black feathered hair piece with some fun red lipstick. It was a perfect outfit for the night of dancing, laughing and having fun. Krysta and Chris really put a lot of effort into the wedding. The DIY button bouquets, wrapped books and gorgeous candle lanterns and the poutine bar at midnight. Perfection! Of course I can’t forget their gorgeous attire. 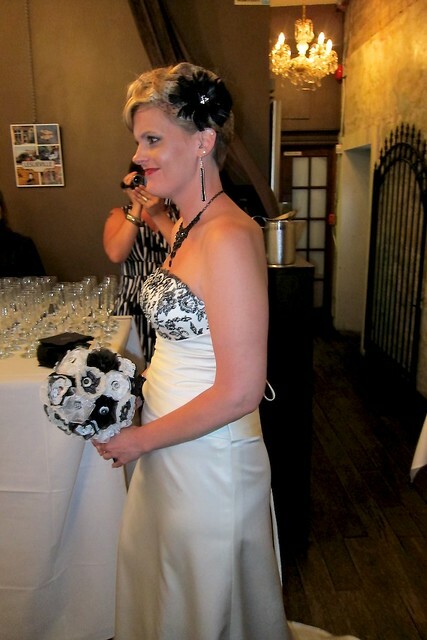 Krista looked breathtaking in her off-white wedding dress with a form fitting silhouette and black lace bodice. 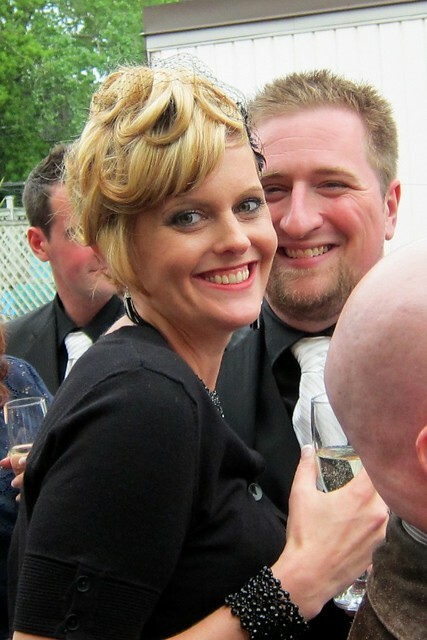 The fascinator and her hair style was just the perfect finishing touch to give her that 40’s old hollywood glamour look. 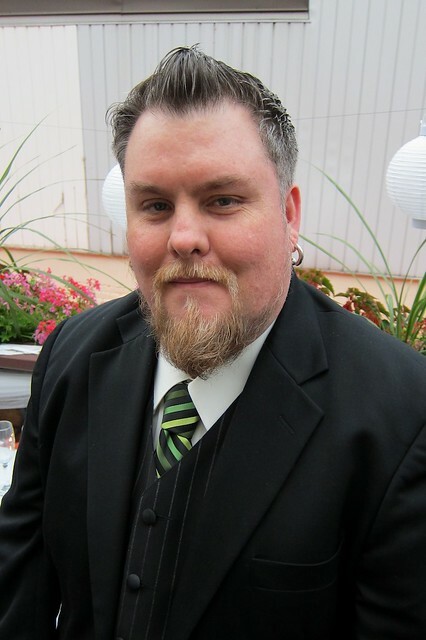 Chris looked pretty handsome as well with his pinstriped suit, black shirt and white tie. Most of all my favourite thing are their smiles. I do not think I saw those smiles falter all night long. That there folks is the face of love. 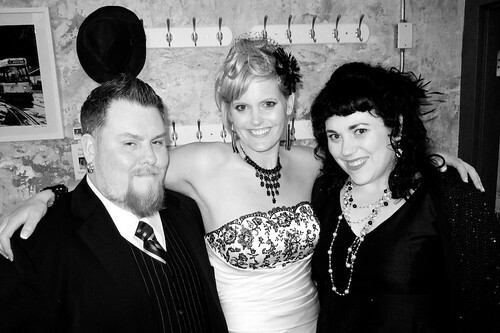 Of course, talking about people in love, always makes me appreciate that I got to marry my best friend and sweetheart. 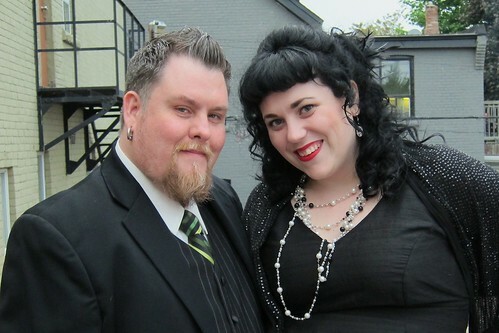 I know I’ve said it before and I won’t get too gushy but I love my husband dearly. I think he looked pretty dashing that night. I love the pin striped vest with the white cuffed shirt and jacket. I think it’s a nice, classic look. 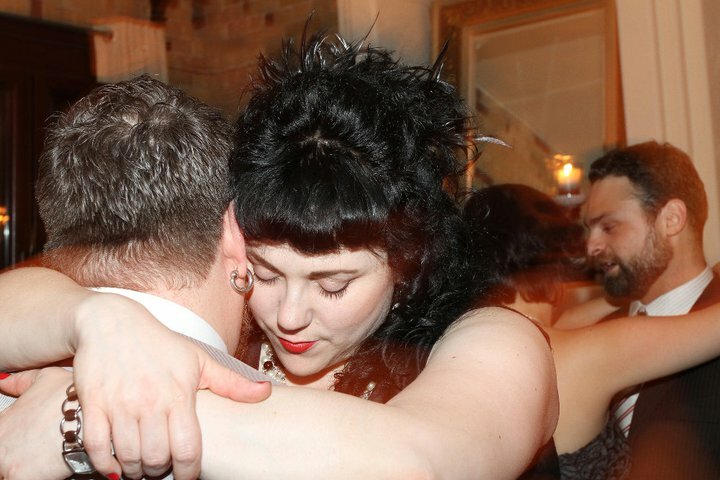 And here is one last photo that Danger Girl Photography took of Gary and I dancing near the end of the night. Go visit her facebook page for more amazing photos! 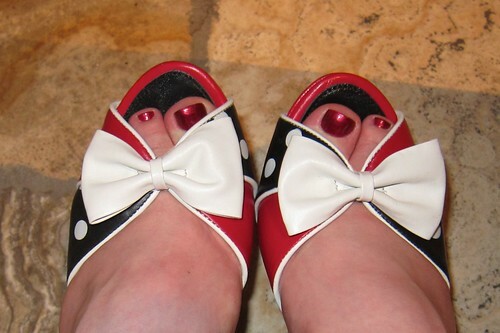 Those shoes … are amazing! But I think my fave picture is the one of the happy couple. You’re right, look at those smiles! 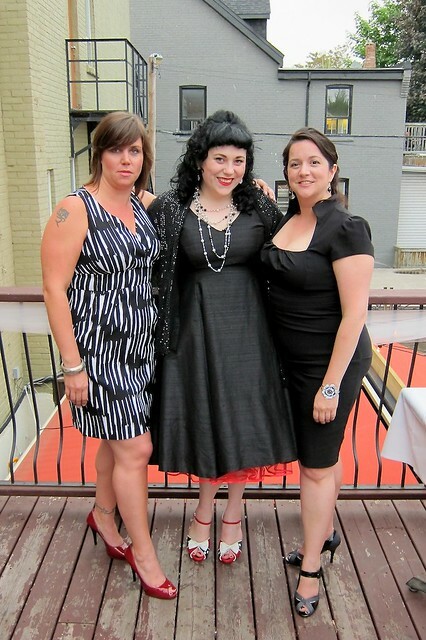 Everybody looks so gorgeous, and I LOVE that Jane Bon Bon dress on you. It’s too bad she’s no longer running her online store. I never had the money to afford a dress from her, but I was working towards it.